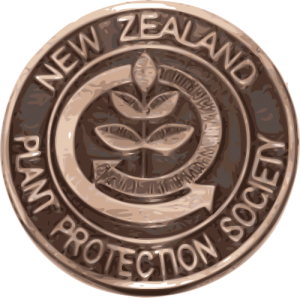 This medal has been instituted by the New Zealand Plant Protection Society to honour those who have made exceptional contributions to plant protection in the widest sense. The medal will be awarded based on outstanding services to plant protection, whether through research, education, implementation or leadership. Nominees do not necessarily have to be members of New Zealand Plant Protection Society. However, those nominating anyone must be a member of New Zealand Plant Protection Society. Each nomination must include a seconder, who should also be a member of New Zealand Plant Protection Society. Nominees would normally be expected to be living in New Zealand, but people living overseas with strong New Zealand connections will also be eligible. Nominations for the New Zealand Plant Protection Medal will be evaluated on a case-by-case basis by the President, Past-President and one other executive member of the New Zealand Plant Protection Society. In the event of a conflict of interest, when a member of the judging panel has nominated a candidate, that judge shall be replaced by another member of the executive committee. The medal may not be awarded if no suitable nominations are received. The medal will be presented at the annual conference in August. Nominations are to be received by the secretary by 1 July each year.